Ensemble also provides specialized business service classes that use this adapter, and one of those might be suitable for your needs. If so, no programming would be needed. See Connectivity Options in Introducing Ensemble. The EnsLib.FTP.InboundAdapter enables Ensemble to receive files via the FTP protocol. The adapter receives FTP input from the configured location, reads the input, and sends the input as a stream to the associated business service. The business service, which you create and configure, uses this stream and communicates with the rest of the production. If the FTP server expects an acknowledgment or response to its input, the business service is also responsible for formulating this response and relaying it back to the data source, via the EnsLib.FTP.InboundAdapter. The adapter does not evaluate or supplement the response, but relays it, if it is provided. Each time the adapter encounters input from its configured data source, it calls the internal ProcessInput() method of the business service class, passing the stream as an input argument. 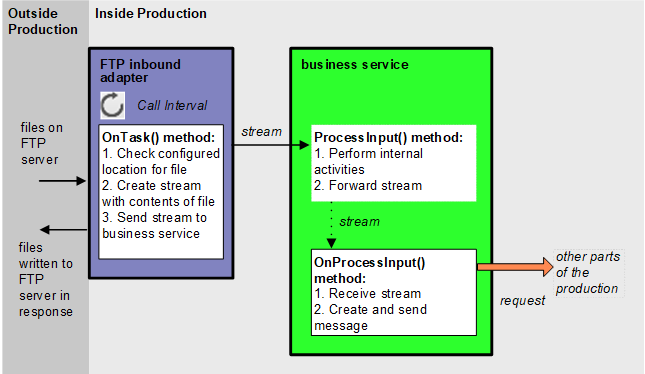 The internal ProcessInput() method of the business service class executes. This method performs basic Ensemble tasks such as maintaining internal information as needed by all business services. You do not customize or override this method, which your business service class inherits. If the data source expects an acknowledgment or response of some kind, the OnProcessInput() method of the business service creates it. The inbound adapter simply relays this response back to the external data source. To use this adapter in your production, create a new business service class as described here. Later, add it to your production and configure it. You must also create appropriate message classes, if none yet exist. See Defining Ensemble Messages in Developing Ensemble Productions. In your class, the ADAPTER parameter should equal EnsLib.FTP.InboundAdapter. For other options and general information, see Defining a Business Service Class in Developing Ensemble Productions. pOutput is the generic output argument required in the method signature. Examine the input stream (pInput) and decide how to use it. When the Charset setting has the value Binary, pInput is of type %BinaryStream and contains bytes. Otherwise, pInput is of type %CharacterStream and contains characters. For information on creating message classes, see Defining Ensemble Messages in Developing Ensemble Productions. For the request message, set its properties as appropriate, using values in the input. Call a suitable method of the business service to send the request to some destination within the production. Specifically, call SendRequestSync(), SendRequestAsync(), or (less common) SendDeferredResponse(). For details, see Sending Request Messages in Developing Ensemble Productions. Connect to the FTP server and log in, setting the directory and transfer mode. Disconnect from the FTP server. Correct the properties reflecting the connection state, in case the adapter thinks it is connected but has lost the socket. ArchivePath is the directory where the adapter should place a copy of each file after processing. Charset is the character set of the input file. Connected is an internal property that tracks the adapter’s connection to the FTP server. Credentials is an Ensemble credentials entry that can authorize a connection to the FTP server. For information on creating Ensemble credentials, see Configuring Ensemble Productions. FilePath is the directory on the FTP server in which to look for files. FTPPort is the TCP Port on the FTP Server to connect to. FTPServer is the FTP Server to connect to. This can be the IP address or server name, as long as the domain host controller can resolve the name. SSLConfig is the SSL/TLS configuration entry to use to authenticate this connection. The following code example shows a business service class that references the EnsLib.FTP.InboundAdapter. /// delete the file before the target Config Item is finished processing it. This example sets the tSource variable to the original file name which is stored in the Filename subscript of the Attributes property of the incoming stream (pInput). Add an instance of your business service class to the Ensemble production.